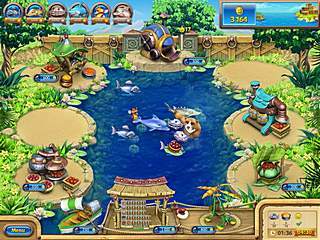 Farm Frenzy: Gone Fishing is another attempt of the developers of Farm Frenzy series to keep the game still on the surface. The previous release (Farm Frenzy 3: Madagascar) didn't get too much of applause among the gamers, so let's see what we have now. This new setting is something totally new for this farming game. 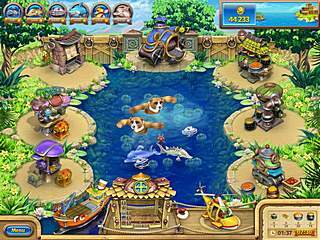 Aquatic theme is especially fresh and promises to take Farm Frenzy to a new level. The only difference is that this time you are going to deal with all kinds of underwater creatures. Even though the game looks like something absolutely different from the previous releases, some of the dynamics are just good old moves you are so familiar with from before. But if you are new to the genre or to the game at all, then you most probably is going to like the hectic running all over the place. You are going to play as Scarlett, the farming genius. History proves that those who become professionals at something usually reap a lot from that. This is exactly what happened to Scarlett. She is finally rewarded for her unique skills, and the prize includes her very own island. Most people would think of their own island as an opportunity to relax and enjoy life. Well, I'm sure Scarlett has had some of those things in mind, it's just that in her case those things have a lot to do with farming. So an island farm is a new project you are to run. If you remember raising chicken, collecting their eggs, then producing cakes out of them, then you know how to play this game as well. The only difference is that this time you are going to deal with all kinds of underwater creatures. You will be raising salmon and then collecting their caviar. Then a few more steps and this caviar is turned into pricely caviar butter. There are also many other animals, like a sturgeon or a seahorse. All of them are new, but they are basicly share among themselves the same functions of the animals from the games in the past. Another thing that is just as true is that the game is pretty crafted in different respects. The game features a total of 90 levels with a lot of incentive to replay some of them. There is also the endless mode that unlocks once you are done with the story mode. If you're still interested in something new, then there is one thing - the game really feels just a bit more challenging. And do you want to know why most of the time? Because of the bears. Yes, there are bears in the game by the way. In some of the stages there are just too many of them. As to the general view of the game, it doesn't look anything like the earlier games. The colors are brighter and the details add enjoyment to the overall vision. Trial version is a good way of determining if you want this sequel or maybe not. 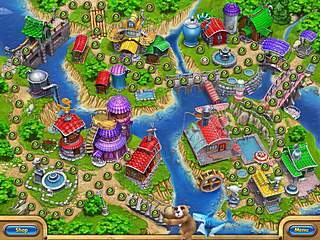 This is Farm Frenzy: Gone Fishing review. Download this game here.